Step 1: Turn on your Mac by pressing the power button by choosing Restart in the Apple menu, or restart it if it’s already on. Step 2: Press and hold the Option (⌥) key (Alt Key on a PC Keyboard) immediately upon hearing the startup chime. Release the key after Startup Manager appears. Startup Manager will scan and list connected drives and volumes that can be booted from, as shown below. Step 3: Highlight the volume you want to use by using your mouse or trackpad, or left and right arrow keys on the keyboard. Step 4: Double-click or press the Return key to boot your Mac from the selected volume. 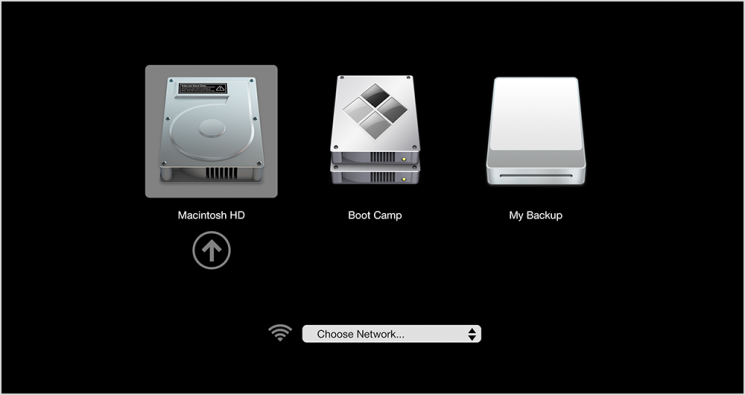 Pro Tip: If there are several USB storage devices connected to your Mac, Startup Manager will only list the ones containing bootable volumes.